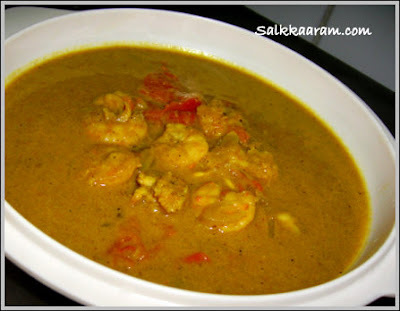 Prawn Coconut Milk Curry | Simple and Delicious ! Saute chopped onion, then garlic ginger paste. Add prawns and powders with salt. Fry for few seconds till the prawns are covered with powders. Then add tomatoes, green chillies, and coconut milk. Boil till the prawns are cooked. Remove from fire, garnish with coriander leaves. Prawns need less cooking time. Cooking prawns for a long time will make it hard. If the prawns /shrimps are medium sized, cook them up to 4 or 5 minutes and for larger size, you can add 3 or 4 minutes too. Don't forget to remove the intestinal vein of prawns before you cook them. Keep the curry for half an hour before you serve. So the juices in the shrimps will enter into the curry slowly and it will make the curry little thick and tasty. Goes well with chappathi, rice & vellappam. Hey i am the first one. Can imagine just serving them with simple white rice. chemmeen curry with coconut milk looks delicious. Prawn coconut milk curry looks lovely! easy way to prepare this dish! I think this will go well with dosais too!! always loved the combo of prawns and coconut milk. I wish I could get some now!! i am a total prawns freak. Loved this version of curry as well. we make prawns in cocnut milk but without ginger-garlic. Chk my first blog of march for the recipe. have never cooked prawns, but i just love their taste:) ....and when prawn is with coconut milk , wah! In this curry, I wouldn't add tamarind, but if you love, you can add little vinegar.this curry is different from our normal fish curries..
hey, I know you love prawns, test this..
yeah, very similar and good with appam..
make it with thick coconut milk powder. Yeah, we can make various dishes using prawn.check the other prawn recipes here..will check yours soon..
hope you are good in health..
Haven't tried prawn recipes yet? don't wait...hope you are back..
let me know the result..hope you will love it..
this is a simple and different from our usual coconut fish curries..
Hi Seena, I made your prawns in curry and coconut milk for a dinner party last night. Delicious. I doubled the recipe and it worked well. One question I have is about the two green chilis that are added with the liquid. Are they whole or chopped. I improvised and chopped my 4 green chilis and added them at the frying stage along with the garlic and ginger. I am curious, though, as to what I was supposed to do with the chilies. Very yummy and a recipe that I will definately return to! Glad to know that you liked prawn curry..what you have done with the green chillies is correct. You have to chop them and can add in the first stage (ie, with garlic and ginger) or at the final stage ie, with coconut milk also..For those who love spicy taste, can add them by crushing, so it will make curry too spicy.. The recipe was just perfect. I tried it out today. I did not have pepper so used chilli powder instead. This chemmeen curry rocks!!! looks divine - is it teaspoon or tablespoon ? I used to put a little bit of tamarind but you're right, vinegar is much better. Prepared this few days back and it was an instant hit @home. Thank you so much!! Hi...I wanted to know if I can use this recipe by replacing the prawns with fish. Would I need to make any changes to the recipe? Bani, sorry for being late to reply.. I needed a shrimp recipe with coconut milk in a hurry so I searched the net frantically; liked yours; tried it at a party I had last night and my guests loved it!! So, thank you for sharing your recipe.